Towing items for Range Rover L405. Inc. VAT: £532.49 Inc. VAT: Info UK VAT charged at 20%. Ex VAT £443.74 Ex VAT Info Outside of EU and EU VAT registered companies only (not UK). 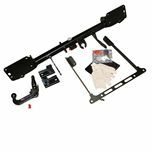 If you need to add a towing kit to your range then you've come to the right place. We sell the VPLGT0082 Multi-Height Tow Bar and the VPLGT0073 Towing Electrics set. Both Towing Items come with 24 months Warranty.